This elegant "Tidewater" Estate Series home will make those afternoon gatherings with friends and family even more special! Enjoy SPECTACULAR SUNSETS on your beautiful lanai, heated pool and spa while sitting alongside a remarkable golf course and lake. 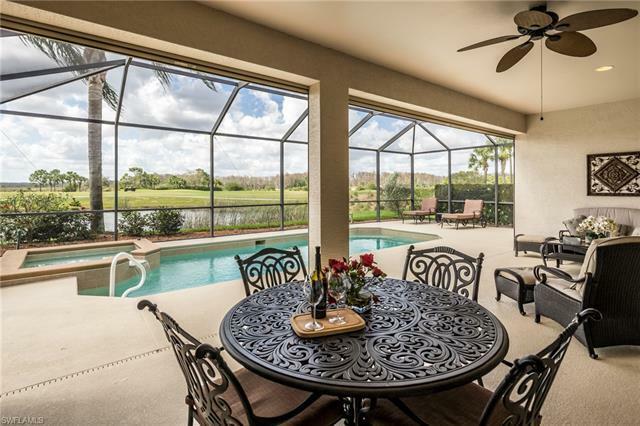 Located in the renowned Del Webb Naples community in Ave Maria, one of the top communities in all of Florida, it includes a golf membership. 3BR+Den, 3BA home exudes quality throughout 2, 338 sq. ft. living space. Drive into your 2 car+golfcart garage and discover updated home w/1yr HOME WARRANTY. Innovations include:updated kitchen w/granite countertops and under cabinet lighting w/a breakfast nook that becomes one of the main gathering places; 2018 exterior painting; porcelain wood-like plank flooring; new pool heater; pool salt water system; garage epoxy floor; crown moldings; NUTONE intercom/sound system; 5 ceiling fans; security system and electric hurricane shutters on lanai. The Resort Style Amenity Center offers pools, spa, fitness center, sauna/steam rooms, activities director, massage therapist, and The Rusty Putter restaurant/bar overlooking the 18th hole! A world of luxury awaits you in this private gated community!